A New Democratic Youth: Citizen participation revitalized? On 14th December 2017 at the meeting of the National Institute of Youth and Community Education (INJEP) in Paris, Céline Martin, University of Cergy-Pontoise, EMA, will present the first findings of PARTISPACE research, with a focus on public concerned and European perspectives from the comparative case study report of the research project. Nowadays, there is a wide range of young people styles of participation in the city life. Many surveys on this topic are highlighting this issue in France. 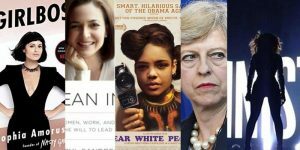 The last few years have been marked by a lot of changes concerning citizen practices, which is questioning again the relationship to politics and democracy. We are especially observing a significant increase of engagement in collective’s movements or associations. From a generational point of view, to what extent do young people have a specific relationship with democracy and politics? Who are those young people, what are their motivations? Are they innovating in a way of doing politics, what are these news forms of participation? What instruments are set up to develop and renew this citizen participation? Finally, are these experimental practices revitalizing democracy or, on the contrary, weakening it? 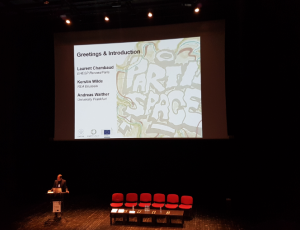 It is in this context that Céline Martin will present the first results of PARTISPACE. The statement will focus on the profiles of young people met in the case studies and on motivation of young people to participate. the final conference meeting of the project took place on April 18th 2018 at the High School of Public health campus located in Paris. In the presence of the European Commission (REA), European research stakeholders, policy makers and practitioners in the field of youth, this conference presented the final results of the research including implications for policy and practice. 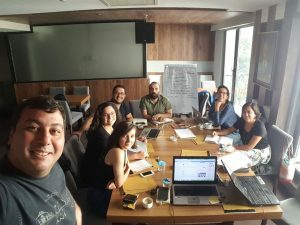 On 9th-10th September 2017, The research team from the University of Yeditepe (Turkey) organized a workshop with the Youth Rights Association in Eskişehir with prominent names from youth work and youth participation field in Turkey: (in alphabetical order: Burcu Oy, Evren Sener Ünal, Necmettin Yemiş, Nurdan Terzioğlu and Musa Çopur alongside with PARTISPACE researchers Demet Lüküslü and Berrin Osmanoğlu ). After fruitful discussions on how to advocate youth rights and how to integrate the knowledge gained from PARTISPACE research on youth participation, the participants decided to design a “tool” based on the Council of Europe’s “Take a Step Further”. 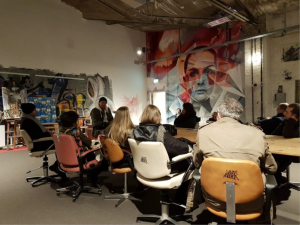 On 8th May 2017, in the frame of the 6th consortium meeting in Frankfurt, The PARTISPACE consortium visited the NaXoshalle Bornheim where Stefan Mohr – a social worker by the city of Frankfurt / Main – works with young people to create a constructive approach to deal with graffiti. A participative approach is used to work with young people, therefore projects are designed with young people together. 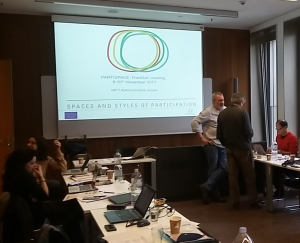 From 8th to 10th November 2017, the 10 teams of the PARTISPACE project met at the Goethe University Frankfurt (Germany) for the 6th consortium meeting. Five months from the end of the project, partners were glad to receive Gudrun Quenzel, reviewer of PARTISPACE for a presentation of the progress in the research especially concerning the local case studies (work package 4), the action-research process (WP5) and the ongoing analysis phase (work package 6). Discussions included sharing about how to get an impact on policy-makers and practitioners, and how the results of the project will help policy makers and youth workers to increase youth participation? From 3th to 6th July 2017, at the University of Amiens (France), Céline Martin (Université de Cergy-Pontoise, EMA) will make a presentation entitled “Empowerment of young adults at what conditions” based on partial results from PARTISPACE project in the framework of the thematic session: «Power of young people, power on young people ». From 10th to 12th July 2017 at the University of Montpellier (France) Patricia Loncle (EHESP, CRAPE/Arènes) and Céline Martin (Université de Cergy-Pontoise, EMA) will present partial findings from PARTISPACE research at the 14th Congress of the French Association of Political Sciences (AFSP). In June 2017, Porto (Portugal) and September 2017, Oxford (UK), Geoff Bright, Harriet Rowley and Janet Batsleer will be speaking at conferences hosted by the Journal Education and Ethnography.